The black-necked crane (BNC) is the only species of the crane family that lives on high altitudes. 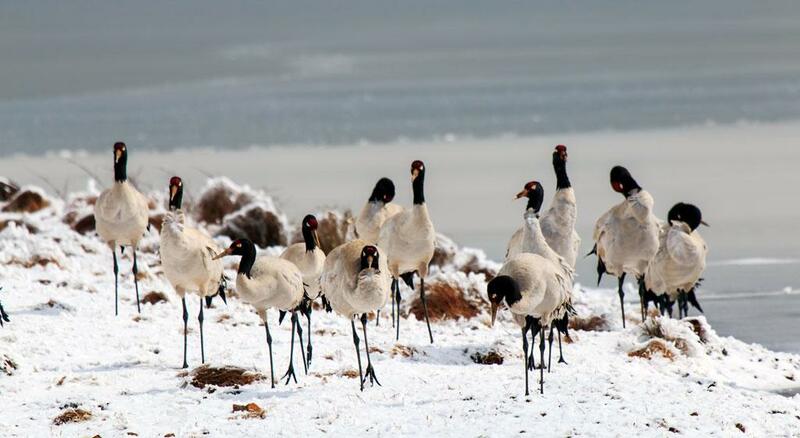 Perhaps due to the difficult terrain, inhospitable climatic conditions and inaccessibility, it is the last of the world’s crane species to be discovered in 1876 by a Russian naturalist, Nikolay M Przhevalsky, in the Chinghai province of China, and remained the least-known crane species till the 1960s. BNC is a tall bird with a height of about 135 cm, a wingspan of about 62–64 cm and a conspicuous red crown on the head. The crane’s scientific name is Grus nigricollis, and it is distributed over the alpine regions of India, China and Bhutan. Buddhists consider it a sacred bird and a symbol of good luck. Bhutan celebrates the arrival of this flamboyant bird every winter, and it is also the state bird of Jammu & Kashmir. Its current population in the distribution range is between 10,000 and 11,000. Though it is stable and increasing, its presence in India is abysmal. A migratory bird, these cranes reside in low altitude regions during winter and move to high altitude wetlands during summer for breeding. Most of the birds reside in China and Bhutan, but some reach India every year to regions that have the same climatic conditions. They arrive in the Ladakh region during March-April for breeding—one of the only two breeding sites in India. The other is Sikkim. As per the latest 2016 census, conducted by a team comprising the World Wide Fund for Nature-India (WWF-India) and Wildlife Department experts, the total population in Ladakh is 111, but this includes only 15 breeding pairs. Though this area is the major breeding region in India and has 22 sites, only one to six birds visit each site annually. The wintering population in India too is almost on the verge of extinction. Pankaj Chandan of the Western Himalayan Land-scape Programme of WWF-India, says, “As per our latest survey, the total non-breeding or wintering population in India is less than 15 individuals, recorded only in the Pangchen and Sangti valleys of Arunachal Pradesh.” These areas are in the Tawang district of Arunachal Pradesh and the main valley is just 1.5 km long and 0.5 km wide. This unknown wintering area was discovered in 2010 when three adults were recorded here. Later, in 2011, some locals who were educated about the cranes, reported a flock of seven cranes (six adults and one juvenile) in this area. Earlier, Apatani Valley in Arunachal Pradesh used to have a large population of the bird, but they abandoned this region after the establishment of two new townships, Ziro and Hapoli. To make matters worse, the locals possess firearms and often kill these birds. Who is chopping their wings? Even now, the bird faces many threats at both its breeding and wintering range. These birds build their nests in vast open environments, making them vulnerable to a host of predators. Chandan points out that changing land use patterns, coupled with a boom in the tourism industry, are posing a serious threat to the species. The species also shares the same habitat which the nomadic herders use for grazing their livestock, and excessive grazing practices are a major threat to the species during the breeding season. The nomads even fence the pastures for their exclusive use. The dogs owned by the nomadic herders and by the armed forces also pose a serious threat to the successful breeding of these birds. These dogs eat the eggs and chicks of the cranes during the breeding season. Asad Rahmani, former director of the Bombay Natural History Society, puts the mortality due to this as 50 per cent of the total mortalities. He also points out that the reduction of habitat is also due to climate change. “When glaciers have melted, marshes will disappear or decrease in extent, leaving very little areas for the cranes to breed and raise their young ones,” he says. We need to learn from countries that have successfully protected the bird. In China, many areas inhibited by the BNCs have been declared nature reserves. India too could use this strategy to revive the wintering population of the species in eastern Himalayas, the Sangti and Pangchen valleys. In Changthang area of Ladakh, tourism and development activities should be regulated at the nesting and feeding sites of the cranes. “Bhutan and India can come together to join the East Asian–Australasian Flyway Partnership and designate sites of international importance along the flyway. They need to initiate the development of a Single Species Action Plan for BNC under the Convention on Migratory Species and the East Asian–Australasian Flyway Partnership,” says Afifullah Khan of the Department of Wildlife Sciences, Aligarh Muslim University. To protect the bird, Bhutan holds an annual BNC festival in the courtyard of Gangtey Gonpa in Phobjikha Valley. This is an occasion for the locals to celebrate the arrival of this flamboyant bird and this festival has become a part of their lives during the winter months. “Jammu & Kashmir too could celebrate the bird’s arrival in a similar way,” says Chandan. Some efforts are on to conserve the bird. For instance, the Indian Army and Indo-Tibetan Border Police are helping WWF-India in various conservation measures.